As most of you know, my company runs a couple dozen websites. Even though it takes a lot more time and effort, I monetize the sites by selling my ads privately as opposed to using a CPC or CPM network such as TribalFusion or Google AdSense. I used to use networks such as those, but by selling ads privately I typically achieve returns of anywhere from 2-10 times as much. Yes, seriously. In fact, it’s even more when you consider that many advertisers who purchase advertising on one of my sites, also request to purchase on several of my others as well. While I’ve always encouraged selling your ads privately when feasible, there is one thing that I should warn you about. As you start selling more ads on your website(s), you’ll start to come across some advertisers who want to purchase for a certain amount of time in advance. Some may want to purchase for 2-months, some for 3 or 4-months, and many actually like to purchase for a year in advance (typically text-link advertisers). Less ‘busy’ work for you: you do not need to edit your accounting records once a month, add and remove the banner or advert, and find a replacement advertiser. Trust me, this can add up to a lot of busywork when you have a lot of websites with a lot of available advertising space. Oftentimes, a big chunk of cash at once can help with your cash flow. You may use that cash to quickly reinvest back into your site, or purchase that domain, tool, or site for sale that you were saving for. Guaranteed commitment. If the advertiser purchases for 6-months in advance, but started to become unhappy with the results after the 3rd month, they have no choice but to stick it out. If you had sold the spot to the advertiser on a month-by-month basis then you would have lost out on the last 3 months. But beware that this can also work against you. Your site may be on an upswing at the moment, and therefore your ad prices are higher than usual. If your site takes a turn for the worst and drops in traffic, you’re still getting paid for the ads at their highest price point. However, this can also work against you (see below). The biggest caveat of all is that you’re locked into the agreement. If you sold the ad spot for a year in advance and then your site suddenly takes off, you could potentially be losing out on hundreds or thousands of dollars. While you might be work out a deal with the advertiser, such as paying them something nice to cancel the agreement, most advertisers would most likely not be happy with this, and would probably not agree. Limits growth. If you slapped one of your smaller sites up with a horde of ads because you never expected it to grow, and then it does grow, you’re stuck with those ads which you sold at a low price and are just impeding growth. SEO penalties. As mentioned above, SEO advertisers that offer to pay you for text links almost always like to purchase for the longest period of time possible. I believe they do this simply because they buy links on so many sites that they don’t want to waste time renewing them once a month. Google is extremely strict against sites that sells text links these days, and if you sold a bunch of text links on your website and then see yourself get slapped with a lower PageRank, you’ll be forced to honour the advertising agreement until it ends. If you’re like me and offer advertisers discounts the longer they purchase (such as 15 or 20% off for 12-months), you’re effectively losing out. I continue to offer this for the reasons mentioned in the Pros section above, but you need to figure out if this would be more onerous for your situation. But the point of this post is to warn you not to do what I did. Two years ago, an advertiser approached me saying he wanted to purchase text links on all of my active websites. I agreed, and added his 125×125 HTML text link to 7 of my sites including my blog, TylerCruz.com. The 125×125 HTML ad contained 7 gambling and poker links and were not set as nofollow. I would now never accept paid text links on my blog, especially not gambling related ones. But at the time, my blog was much smaller, having only around 400 RSS subscribers. It was also around the time that I was just beginning to monetize it, so the decision to accept the ads seemed easy to me. As you can see, I made $4,700 within a few minutes. I completely understood that 2-years was a very long time, especially online, but I also knew it was an incredibly easy way to pocket 5 grand. Besides, all I had to do was add a simple 125×125 ad on half a dozen of my sites, right? For the most part, the deal did work out rather well for me. Many of my smaller-medium sites such as Movie-Vault.com and MovieForums.org are what I consider lower-quality sites, even though they get some decent traffic. I therefore slap a lot of ads on them as they don’t appear to have a big impact on them. Where I did lose out on this deal was agreeing to put the ad on my blog. I hadn’t given myself enough credit to where I could see my blog taking off to the point to where it is today. As a result, I believe the paid text links (unrelated gambling ones no doubt) had a negative impact on my PageRank. They were the only gambling and paid text links on my blog. Even taking the SEO penalties out of it (if there were indeed any), you can see from above that I had sold the 125×125 spot at a base price of $25 a month. At the time, that was more than I was selling them as I did know that my blog would grow, and so the inflated price to the advertiser was to help compensate for that future growth, but I didn’t estimate it close enough since I now charge $50 a month – exactly twice as much. On my poker site, PokerForums.org, the result wasn’t quite as bad as on my blog since I was already selling a lot of paid text links and since the site is gambling related, but I did lose out on the fact that since the slot was sold, I couldn’t modify the bottom of the site and convert it to a 728×90 banner instead. The results could have been worse for me, and as I say, it did work out for me pretty well in the end on my other sites, but it did hurt my blog. I still accept advertising for 1-year in advance, but you need to be careful about just blindly accepting such deals as you never know how much or how fast your site(s) can grow. The advertiser’s ads expired two days ago on May 8th, 2009 and I just removed them this morning. It felt fantastic to finally be able to remove the gambling text ads from my blog (as seen in the top left of the screenshot below). 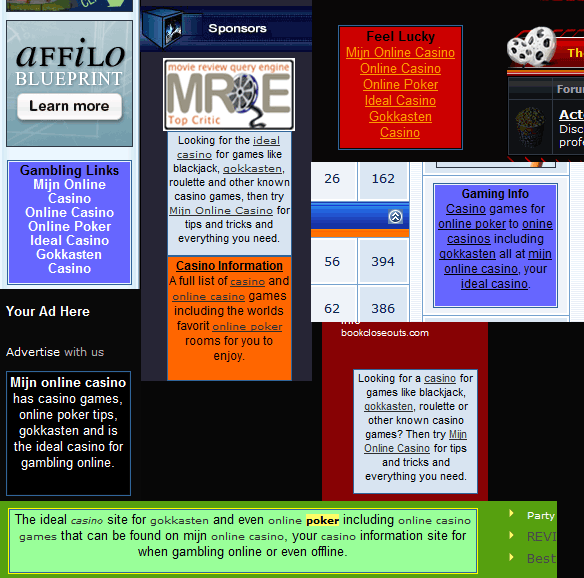 I made a quick collage of the 125×125 (and in the case of PokerForums.org, a 468×60) HTML text ads that were on my 7 sites for a full 2 years below. Good riddance! If you sell your ads privately, make sure you properly evaluate your site(s) before accepting paid advertising for a long period of time. Make sure that you won’t be regretting it if your site suddenly takes off. I should have never accepted those paid gambling text links on my blog since my blog is extremely high quality in terms of content. Awesome post! I do not think I will be adding advertising on my new Blog for a while. And it’s definitely going to have to be relevant with my topic. 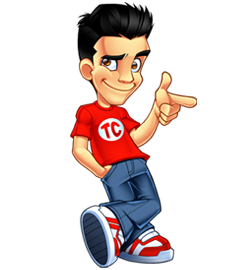 this is an awesome post Tyler..really informative and useful tips…thanks! I used to wonder why you had those links, lol. I would have done the same thing though, so it’s not your fault. I actually did that with 2 advertisers for 1 year, but it was ok and not gambling sites. Great advice as usual Tyler! 🙂 And I really like the pros you have thus indicated, they are soo true. I am wary of the caveats though. It’s true, ads can be really lucrative, so play your cards wisely! I’m not sure that selling text links on your blog is ever a good strategy. Sure you get a chunk of $ upfront, but it seems as though you would be better off using the link equity on your own higher-performing subpages. I did a very similar post recently, basically I got burned for selling links through TLA. I’ve gone to Google for a re-inclusion so fingers crossed but I will never ever sell followed links/advertising again, either through a broker or directly. What I did want to say though is rather than selling advertising have you not considered the other option and using your own affiliate links? Most advertisers are trying to use your traffic to push a product. Obviously there is a gamble in promoting the product yourself but it can pay much more than accepting advertising. For example I refused to renew on a $25 a month advert and instead used the space to promote a service myself, I made over $400 in the first week. you should check out openx.org, its free, they are an all in one solution for running network of sites using different adversiting. You can split test adbrite/adsense/amazon/yahoo ads to find out which one makes you more,and it does private ads as well, so when an adverstier’s term is up/don’t pay/ with a click you can switch all his ads over to another default banner or adsense, etc. When I was running 600+ websites with this system and it would automaticlly configure each site ads to make me the most money. Yeah, I had played around with OpenX (Formerly under another name, I forget what it was called) but at the time they had yet to integrate any payment options. Do you know if they have finally added full automated payment solutions? Because if not, it really doesn’t have many benefits over doing it by hand, for me personally at least. Why not just use OIOPublisher? I don’t mean to state the obvious here, but why didn’t you just pull the ads from your blog if they were causing a problem? Either refund the advertiser or worst case, just ditch them anyway – especially if you’re not looking for any repeat business! This is a great post and I’m glad I read it. I am in the process of evaluating advertising space on my site and this was a real eye opener. One challenge I still experience is determining the rates to charge per banner spot. At present it’s all guess work, I don’t have a formula and it concerns me…as I feel am under charging. I always price it based on demand. If you have a long waiting list then you need to raise it. If you aren’t getting enough advertisers then it’s too high… eventually you’ll have a feel for what a good price is and can change it accordingly. One thing you may be forgetting, however, is the value you received for getting that $4,700 in the first place. Meaning, when someone pays you $4,700 for advertising, that boosts your confidence in your sites, it increases your “Blog Income Report” stats etc. which all contribute to the success of your Blog. The advertiser and you had no idea where your Blog would be for the next 24 months. You could have stopped writing content, your Blog could have dropped its traffic rankings etc. It’s always easy to see things in hindsight, but when looking into the future it’s not as easy, and it’s a risk vs. reward calculation that has to be made by both sides. Knowing what you know now you probably wouldn’t accept that deal, but if you traveled back in time to that moment and only knew what you knew then, I bet you’d take that $4,700 every single time. Another perspective you could have on the situation could be to express gratitude to the people who invested in $4,700 in advertising on your site because they obviously believed in your future success. At that moment in time, they obviously saw your future success more clearly than you did, otherwise you wouldn’t have accepted the deal, so that had to have a positive confidence boost effect on you on top of the money you made. I still remember the first advertiser who bought a $25 ad from me. It was only $25, but it gave me a huge confidence boost in my Blog and it’s value to the world, and I’ve very grateful for that. Not disagreeing with the message of your post, but just offering another opinion. Could you tell me how you go about attracting private advertisers for your blog? I just put up an advertising page… that’s all I’ve ever done and I usually have a waiting list for ads too. Yeah I reckon those ads definetely would of had a negative effect in some way on your sites.. Good to hear they are gone now though.. Next time just make sure they are nofollow and related..
It’s good to be able to reflect and see the mistake you have made and try to warn others of them.. Good on ya! Bonus Points! This has been a very wonderful and informative post. Not only that, it is also filled with morals that you can and must learn while doing business online or offline. I cannot agree more with the message you are trying to convey. True enough, with ads, you will have a less busy work ahead of you, but there are way lot of oppurtunities that you should open your eyes on to succeed. thats a good piece of info.. thanks for the advice and caution tyler.. will remember from my next link sales! The problem with long-time deals is that your website’s worth will probably go up and the money you get won’t. If you go on month-to-month basis you can renegotiate higher prices. If you pocket all the money at once you can’t do that. I just stumbled across this site doing some SEO research. I’m still new to this and found your post very informative for me. Thank you!